Marytown Prison Ministry introduces the spirituality of St. Maximilian Maria Kolbe, OFM Conv., who himself was an inmate, to the incarcerated population through the help of facility chaplains. We are the only Catholic Prison Ministry in the United States which seeks to promote consecration to our Mother Mary as a first step on the spiritual journey, placing inmates on the right path to the ultimate destination which is Eternal Salvation. Our goal is to guide the inmates&apos; soul to salvation by providing Catholic Bibles and spiritual material to light the way and to bring individuals closer to Jesus through consecration to His Immaculate Mother, Mary. We promote self-worth, healing, community and prayer among all prisoners through consecration to the Immaculate Virgin Mary, prayer and printed spiritual material. Volunteers correspond with inmates and chaplains, send bibles, rosaries, information on the life of St. Maximilian Kolbe, and consecration to Jesus through Mary in the Militia Immaculta. 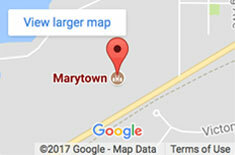 Established in 1996, the Marytown Prison Ministry has grown to a nation-wide apostolate, serving over 275 prisons and correctional facilities and reaching more than 600 inmates per year, many of whom have consecrated themselves to the Blessed Virgin Mary. DONATE TODAY to support the Marytown Prison Ministry.